Home » 3 Best Reusable K Cup Filters for Keurig: DIY K-Cups Save Money! 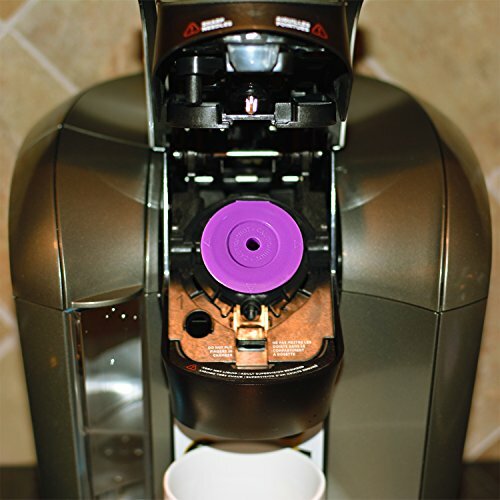 3 Best Reusable K Cup Filters for Keurig: DIY K-Cups Save Money! If you own a single-cup Keurig and like money, the environment, gourmet coffee, or all three; it’s time to buy a reusable K-cup filter for your favorite coffee maker. All reusable coffee filters work the same way: you fill the basket with your favorite grinds, secure the lid on top, and place it into your Keurig single-serve machine to brew a hot, delicious cup of coffee. Today I will review the Keurig My K-Cup reusable filter which I regularly use, and its two closest competitors, the Ekobrew and Froz-Cup 2.0. In addition to my experience with reusable coffee filters, I’ll rely on industry experts and verified purchasers I call my Coffee Brigade to help me create a fair comparison. This is not a “one-size-fits-most” kind of review; each single-serve Keurig brewer needs a particular type of reusable coffee filter, so it fits properly in the machine. Before you begin shopping, find out the model number of your brewer to ensure you pick the right one. To help you find that perfect match, at the end of the review I will provide a chart to help identity which filter you need based on your model number. I would love to say the reason I purchased a reusable K-Cup coffee filter was to create less waste and be a good global citizen, but that would be a lie. I bought it because I was sick and tired of spending $7.99 or more for a box of pods that would last me a couple of weeks. Also, my taste matured and I realized some of these pods were stale, even bitter, so I wasn’t even getting a return on my obscenely priced investment. Consumer Reports claims the average cup-a-day drinker spends more than $200 a year when they solely rely on coffee pods. That’s a lot of money for a home brewing method most buy to save money—and that doesn’t even factor in the cost of the machine, cream, or sugar! If that’s the case, I would rather take that money for a real coffee house experience. Good for you! Reusable K-cups means you will no longer be responsible for adding to the pile of used pods filling landfills each day. When I was a new coffee drinker, I thought the pods were awesome. Keurig offered so many caffeinated choices literally at my fingertips! Fast-forward a decade, and now I know what a great cup of coffee should taste like, and that that taste doesn’t come from a pod of stale grinds. Reusable K-cup filters allow you to brew your favorite fresh grinds whenever you please. Amazing, life-changing, smack-your-mama coffee comes from fresh beans! We all know this, yet somehow, we have tried to convince ourselves that pods contain this same caliber of coffee while we know, those grinds have sat for weeks, sometimes months! I don’t care what vacuum sealing technology you claim to have, those are old grinds and won’t give you the fresh experience you crave and deserve. I will now step off my coffee soapbox and start my comparison. I’ll review three of the best reusable filters on the market today: the Keurig My K-Cup Reusable Filter, the Ekobrew Refillable K-Cup for Keurig Brewers, and the Froz-Cup 2.0. Are you ready to say goodbye to expensive pods that create more trash than flavor each time you brew? Let’s get started! Description: This filter is durable, easy to clean, and holds up to 12 ounces of coffee grinds. The last image on the right shows how the pieces fit together. After filling the basket with your favorite coffee grinds, you secure the top by simply twisting it. You then place it in your Keurig, and it acts just like a pod, creating a pressure-based system to brew your coffee. I have this model and love it. It’s easy to use and more importantly a breeze to disassemble and clean. This is critical since old grinds left in the filter will sour the next cup of coffee if they aren’t removed. If you don’t have time to clean it by hand, it’s dishwasher safe but make sure to place it on the top rack. Reviewers noted that for this filter to work, you must remove the Keurig pod holder to brew which some found cumbersome. I don’t think it’s a big deal. Some reviewers also gave it a bad review simply because they hadn’t realized it wouldn’t fit in their machine, so make sure it’s compatible with your machine before purchasing! 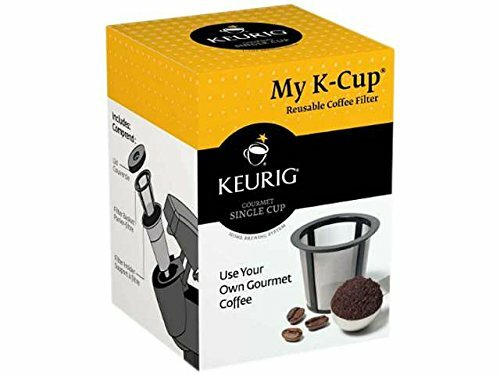 Verdict: if you own a Keurig and want a safe bet when transitioning from K-cup pod brewing to reusable filters, stick with their brand of reusable filters. Description: The Ekobrew website says this reusable filter is easy to use and clean and produces a stronger brew than the average K-cup reusable filter. This animated explainer video shows there’s not much difference between this filter and the My K-Cup filter. The Ekobrew is certified Made in the U.S.A. product and is made with 100% BPA and lead-free material. A unique feature of this filter is that it may be used with or without a filter. Overall, they like it. 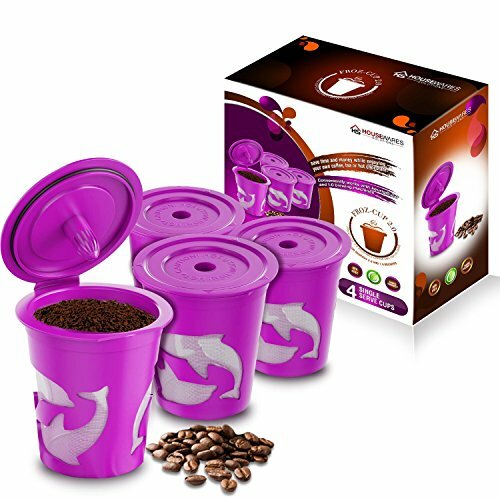 They say it is easy to use and clean, and some claim it’s larger than other reusable filters so they can add more grinds to get a stronger cup of coffee. Verdict: To be honest, this image discouraged me from trying the Ekobrew. Sure, I appreciate a company being honest and helping their consumers with online tutorials, but I’m usually half-awake when I brew as it is, so the easier a reusable filter is to use, the better. 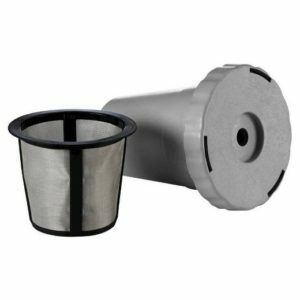 Description: The Froz-Cup comes in a 4-pack set and features a stainless-steel micro mesh filter. What’s unique about this filter is the lid has been specifically designed to resist high temperatures to help preserve the flavor of whatever you brew; coffee, tea or hot chocolate. I was intrigued by the Froz-Cup for several reasons. First, it offers a lifetime money back guarantee which will make any coffee drinker at least want to give it a try. The price is similar to that of the My K-Cup and Ekobrew, except you receive three additional filters! How can they offer the same product, at a quarter of the cost? Either it’s too good to be true, or a great deal. The Froz-Cup also received the highest amount of praise on Amazon when compared to the other reusable filters receiving an impressive 4.6/5 rating. So, what gives? Many reviewers gave the Froz-Cup a 5-star rating simply because it fit in their Keurig machine. Others appreciated not having to remove the K-Cup cradle. People loved that they got a good deal with some saying they pre-fill all four which makes it even easier to use a reusable filter—just like a pod experience without the trash! Others like that it brews not only a great cup of coffee but also hot chocolate and tea too when they feel like mixing it up. While most reviews were positive, some gave the Froz-Cup a negative rating because of the time it took to brew a cup. Some claim it’s the dolphin design on the side that holds up the brewing process. Verdict: I would have to go with the masses on this one and recommend it based on my research. I like that it comes with four filters instead of the typical one, and it doesn’t bother me that it might take a couple of extra minutes to brew. After all, the more time it takes to pass through the filter, the stronger my cup of coffee. I hope this review helped you find the reusable coffee filter you were searching for today. Below is the chart I promised that can help you find one that is compatible with your machine. Good luck! Previous Post: « Best Prime Day Coffee Deals for 2018: Deals on Coffee Machines, Keurig, and More! Great review, thank you. I have used the official K cup filter because the use of the menu – do any of the ilers you reviewed allow the menu of options to come up?